We almost don’t want to tell you about the new Subaru Impreza WRX STI S206. Why? Because it’s the fastest, best-handling WRX Subaru’s STI division has ever produced, but you can’t buy it in the U.S. It’s yet another special STI limited edition built exclusively for Japanese domestic consumption. Subaru’s tuning department takes its STI “S” series very seriously, something we witnessed at the recent Tokyo Motor Show when it revealed the new S206 with its eye-popping spec sheet. There’s more than a decade of history in the top-shelf S series, starting from the radical-looking S201 to the gutsy S204, and the extreme R205. We’ve driven them all and been suitably impressed with every car. But the S206 takes “S” to a whole new level. You know you’re in for something special when the person greeting you prior to the drive at the Cycle Sports Center two hours south of Tokyo is none other than STI’s motorsport director, former chief test driver, and all-around Nurburgring-meister Hideharu Tatsumi. After a quick rundown of the impressive spec list, he shuffles us over to an S206 sitting in the pit area. Smiling confidently, he opens the door to one of only 100 NBR Challenge Package models of the S206, a super rare edition celebrating STI’s monumental class win in this year’s Nurburgring 24-hour race. With its unique 19-inch BBS rims and hard-core carbon-fiber roof and rear wing, the NBR certainly looks the part. Powering the S206 is a version of Subie’s turbocharged 2.0-liter boxer from the WRX STI. Horsepower has been bumped from 305 hp to 316 hp while torque increases from 290 lb-ft to 318 lb-ft. The engine is hand-built, with pistons, connecting rods, and crankshaft all meticulously balanced before assembly. The secret to the S206’s improved performance comes from the newly fitted low friction, twin-scroll ball-bearing turbo, a remapped ECU, and a low back pressure exhaust system that boosts low- to mid-range torque. Built off of the outgoing WRX STI platform, the S206’s suspension gets specially fitted inverted Bilstein dampers, STI coil springs, and a flexible front strut tower brace, while those 19-inch rims are wrapped in Michelin Pilot Super Sports rubber (245/35ZR19), highlighting huge six-piston Brembo calipers with drilled rotors. As we launch ourselves out of the blocks, the S206 feels at once poised and ready for any right boot extension. And any corner. Switching the VDC to S# for maximum throttle response, and with the updated DCCD (driver controlled center differential) left in normal mode, we gun the boxer engine in first and second to record a stopwatch-timed 0-60 mph sprint of around 4.5 seconds. Compared to the current WRX STI, the S206 displays beefier torque between 3200 and 4400 rpm — where you need most for quicker cornering exits. But as Tatsumi says, “this torque curve also makes it easier to putter round town as well.” Right, but that’s not what we’re here for. Zeroing in on a tight right-hander in fourth at 100 mph, we obliterate 50 mph in 1 second flat by jumping on the 6-pot Brembos, pop the notchy six-speed gearbox down to second and turn in. Whoa.. It almost defies logic. How can you make an Impreza WRX corner with so little roll, maintain so much lateral grip, and yet retain such comfortable ride quality? It can’t just come from the specially fitted Bilstein inverted dampers, coil springs and tower bar. Back in the pits, Tatsumi lets on that his team has brought across some “little secrets” from the STI race car, which they are preparing for a second Nurburgring 24-hour challenge in 2012. A carbon roof that improves ride quality? OK. We can’t argue with that because the ride quality is exceptional — firm but compliant – for a hard-core sports model like this with low profile 19-inch tires. The combination of suspension upgrades and high-grip Michelin tires also meant Tatsumi’s team was able to dial back the steering gear ratio from 13:1 to 15:1, which makes the S206 turn in at speed as predictably as the actual race car, with logarithmic loads of grip and more steering feel and feedback than any STI before it. This car simply begs you to push it harder each lap. Your insides just about reach their lateral limits before the tires reach theirs. There’s almost no understeer and the rears won’t let go either. The engine, chassis, steering, and brakes are so communicative and responsive, they almost feel like an extension of your body. The car goes exactly where you want it to, when you want it to. Tatsumi tells us that he wanted his team to build a car that wasn’t just the best STI so far, but create a car that communicates so well with drivers that it makes them better drivers, or at least feel as though they are better drivers. Can’t argue with that theory either. As I honed in on a tight corner at over 110 mph, crunched on the Brembos, changed down and got back on the gas as my brain tried to dislodge itself from my skull and fly toward the scrub, I have never felt more like seven-time World Rally champ Sebastian Loeb. Inside, the lucky 300 S206 buyers get Recaro sport seats wrapped in leather and Alcantara, and plenty of S206 badging to remind them not to worry when an ordinary STI pulls alongside them at a traffic light. So it begs the question: Why doesn’t STI offer an export model, even a very limited edition run, for the U.S. market? According to Tatsumi, there are two reasons. First, even with two catalyzers fitted to reduce CO2 and NOx gases, the S206’s emissions won’t meet current international standards. But more to the point, the ballistically strong Japanese Yen means that this car, which costs roughly the equivalent of $77,000 in Japan, would cost somewhere around $85,000 if (and when) they ever made a left-hand drive version. And that kind of pricing would put it in Nissan GT-R territory, making it hard to justify. But then again, even if you did have the cash and wherewithal, and even if you were happy with a right-hand-drive version, you still can’t have one because the full lot of 300 (200 stock and 100 NBR editions) has already sold out. As Tatsumi points out, “if you want to drive this car, you’ll have to come to Japan.” Makes sense. If you want to eat the best, most authentic sushi, you have to come to Japan anyway, right? Subaru will be going it alone on its first hybrid-powered vehicles, a new report finds. It was thought that Subaru would lean on corporate partner Toyota for its hybrid technology, but a Subaru executive says that will not be the case. Toyota purchased an 8.7 percent stake in Subaru back in 2005, which was expected to lay the groundwork for a hybrid partnership between the two. However, an un-named Subaru executive has revealed to just-auto that the company will not be borrowing Toyota’s Hybrid Synergy Drive technology. Instead, Subaru engineers will develop their own hybrid system. Unlike Toyota’s HSD, Subaru’s system will be based on a mild system like those used by Hondaand General Motors. Although that means Subaru’s hybrid vehicles won’t be able to operate in electric only mode, they will use a small electric motor to aid in vehicle acceleration which will boost overall fuel economy. Subaru’s hybrid technology will likely bow in 2013 in the company’s Legacy model. The hybrid Legacy is expected to first launch in Japan, but Subaru has plans to quickly bring the green technology to the United States. It remains unclear, though, if Subaru’s first hybrid application for the U.S. would be the Legacy or another vehicle like the Forester crossover. Whatever the case, look for Subaru’s first hybrid to retain the company’s signature boxer engine and all-wheel drive. Exquisitely balancing the enjoyment of driving wîth environmental friendliness, the car, under its product concept of ‘Revolutionary Sports Tourer’, embodies Subaru’s theme of ‘Confidence in Motion’. This C-§egmènt class car was developed as a new-generation sports wagon providing both superior driving performance and utility. It features an innovative exterior design not found in conventional wagon models and expert wagon utility Subaru has cultivated over the years. The well established sports power unit, the Horizontally-Opposed Subaru Boxer engine, is now wîth direct fuel injection. This highlight mixed wîth Subaru’s downsizing concept and original Hybrid Electric Vehicle (HEV) expertise has enabled Subaru to make considerate progress on its unique Symmetrical All-Wheel Drive (AWD) technology. An even sportier drivability and advanced environmental friendliness are both attainable in this new conceptcar. • Subaru’s brand statement ‘Confidence in Motion’ is portrayed in the outward design as well. The dynamic yet sleek look promises an enthusiastic drive, while the cabin offers all the usability of a C-§egmènt wagon. • A large monitor is built into the §teering wheel allowing access to maps, television and internet services. • The downsized direct fuel injection turbo engine is one of the principal technologies that will guide Subaru’s engine strategy in the future. Not only is acceleration quick and smooth wîth the new-generation Horizontally-Opposed engine, it is environmentally friendly. The direct fuel injection system which injects necessary amounts of fuel into the cylinders at appropriate moments, and a turbo system which efficiently supplies large amounts of air into the cylinders, along wîth the downsizing of current turbo engine displacements (2,500cc and 2,000cc) to 1,600cc drastically improve combustion efficiency at practical driving-speed range compared to the existing turbo engine. • This system has an Electric Vehicle (EV) mode which allows AWD motion using only the motor at start-ups and low-speed drives. When decelerating, the regenerating mechanism uses the motor as a power generator. The Subaru XV Concept is a design concept car that defines a new generation of crossover vehicle, blending exceptional SUV practicality with a fashionable form. It was specifically designed for customers who are looking for a vehicle offering looks, benefits and a packaging that stretch beyond those from the populated crowd of existing crossover models. Subaru are on the verge of sealing a deal with China’s Chery Motors that should see them producing the Forester in Chery’s new factory in Dalian, but a new advertisement for Subaru’s Trezia model in Italy may well delay any official seal for the joint venture. The Italian advertisement which reportedly translates as saying “a high driving position and superior internal space is worthy of a revolution” with a picture of China’s first chairman Mao in the background but with a feminine face superimposed on top. Subaru is not the first company to anger the Chinese internet with an advert that passed certain cultural boundaries, in 2008 Citroen upset the Chinese people in Spain with a picture of Mao Ze Dong with his face crunched up, of course this was prior to the Olympic torch relay issue in Paris which kicked off several months of hatred for all things French in China, of course the mob mentality eventually died away and Citroen enjoyed strong sales in the following years. There is still a festering wound in China for Japanese actions in World War Two, so Subaru’s rather ill timed advertisement is only likely to affect any on-going negotiations for its joint venture in Dalian with Chery, until at least Subaru delivers a grovelling apology. 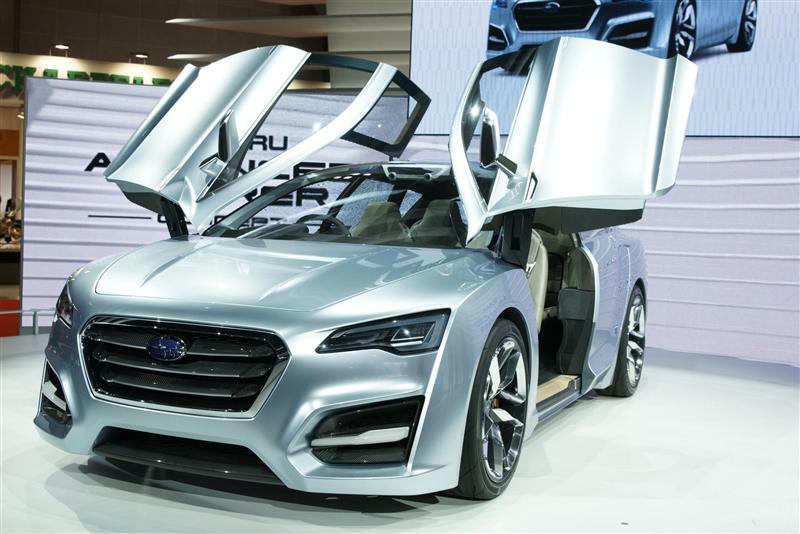 Subaru China were unable, or unwilling to comment on any actions taken by Subaru Italy and claimed to have no knowledge of the advertisement when prompted by Chinese media outlets. Expect an internet outcry over the next few days from patriotic Chinese and a boycott of Subaru’s products that will last at least a few days. The Trezia is powered by a choice of two engines, a 1.3i version and a 1.5i unit. Both are paired with a CTV transmission, while the compact is being offered in a choice of either two wheel drive or four wheel drive configurations. “We will pursue our compact car business on an original equipment manufacturing basis under the alliance,” Ikuo Mori, president of Fuji Heavy Industries said in a press conference held to honor the launch of the model. The Trezia is the first model to be manufactured by Fuji Heavy Industries after the tie up with Toyota back in 2008. It will most definitely not be the last, as the two plan to launch a production version of the FT-86.